A small positive day in the Daily Index but the most notable feature was the volume. 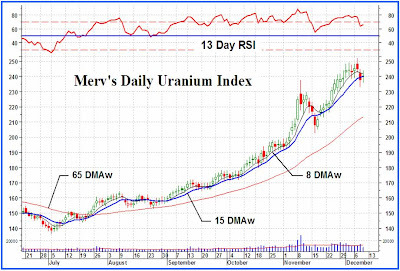 The low volume seems to indicate that the speculators, those that move markets, are not too enthusiastic about the uranium stocks right now. That could change over night but at this point they are not really in the market. Once they come back the question will be in which direction will they be making their bets. I would hazard a guess that it will be in the direction of a continuing bull market but let’s wait and have the market action tell us which way the wind is blowing. 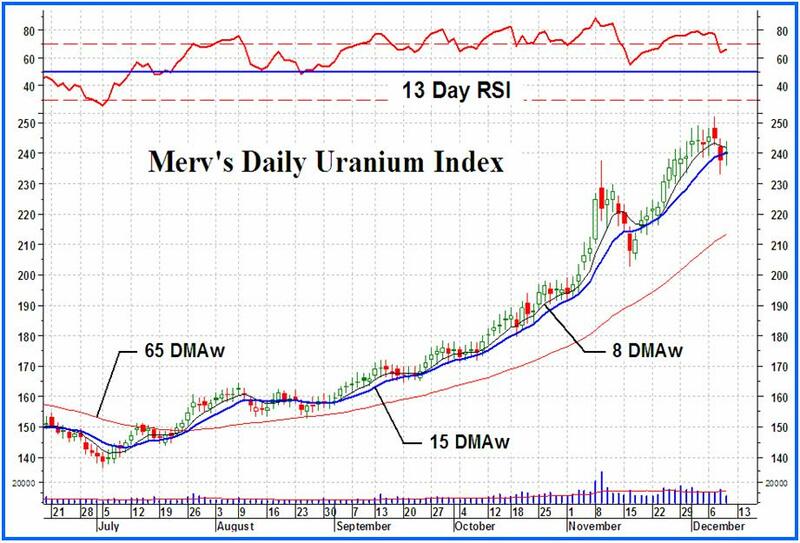 The Merv’s Daily Uranium Index closed higher today by 2.63 points or 1.10%. There were 23 winners, 21 losers and 6 stocks doing who knows what? Cameco gained 1.5%, Denison gained 1.2%, Extract lost 0.6%, Paladin gained 2.7% and Uranium One gained 1.0%. The best winner of the day was Benton Resources with a gain of 11.1% while the loser of the day was Pele Mountain. Market Vectors Nuclear Energy ETF gained 0.8%. The Global X Uranium ETF (URA) closed at $19.80 up 1.04%. I’ll try to include this ETF in the daily commentary as it is more into the uranium stocks than the Market Vectors ETF is but it will not show up in the Table of Index stocks for some time as I need a years worth of historical prices for it to be included in the Table and Index. When I have those historical prices then the Market Vectors ETF will most likely be replaced. Only the short term has changed. With the Index closing slightly above its short term moving average line and the line continuing to point upward the short term rating has moved back to the BULLISH level. The very short term moving average line is still confirming this rating by remaining above the short term line. I’m back to the lateral direction as the direction of least resistance (where I should have stayed yesterday). The Stochastic Oscillator continues to move ever lower and is now almost at its oversold level. Maybe another day will do it. Merv, Thanks for all your good work I been a faithful reader for at least 2-3years when I first discovered your Commentary.. 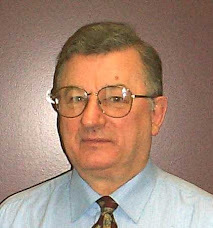 When I read your getting close to retiring I know I will miss your wonderful expertise. I also wanted to write to let you know you can't retire just when our uranium stocks are taking off! (Ha Ha) Just kidding but when you do retire, you shall be greatly missed. Comment: Are stocks such as UEX, DML, MGA and possibly others making bullish flag patterns. Could you please comment on you blog. Thank you for your valuable advice. A fan and dedicated reader. Thanks for the very kind comments. Retirement - not yet but who knows, maybe tomorrow, Lottery Quebec willing. However they are pretty tight with their money, at least as far as this direction is concerned. I would not read flags in any of the stocks. UEX may have the very eary beginnings of a bearish rising wedge pattern, but very early and anything can happen. The other two are just in topping mode with no pattern. You need more than a day or two to form a resonable pattern. For a flag you should have at least a couple of weeks of action to be able to draw decent trend lines.